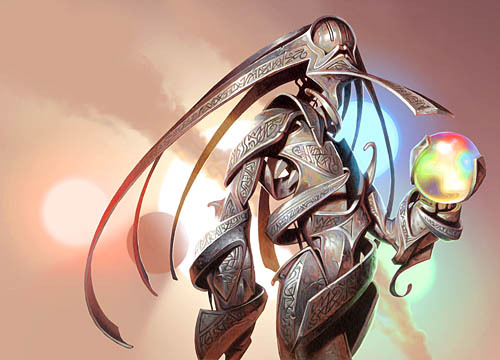 While not directly tied to Mirrodin thematically, it would be impossible not to acknowledge the heavy imprint of that set and story upon the Metallic Dreams Planechase deck- a design which rests very heavily on the golems and their affiliated kin. Metallic Dreams is an uncommon thing- a deck which shies away from allegiance to and playstyle of any particular set of colours, instead choosing to both embrace and shun the coloured path on its way to victory. That may seem impossibly contradictory, but once you dig into the deck it begins to make perfect sense. We’ll start our analysis of this most unconventional deck in a conventional manner, by focusing first upon its creatures and the role they play. As with Archenemy, Ertai’s Lament is less worried about the Planechase mechanic (planes, die, and all), but rather how the actual preconstructed deck itself plays out. 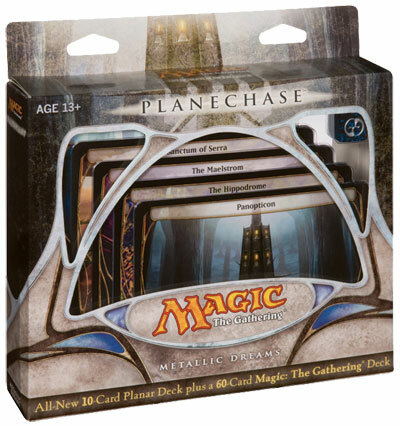 The Planechase design proper can be lots of fun and has been covered extensively elsewhere- we’ll be looking at the deck. One of the more notable aspects of the deck is that while it contains within it multiple ways to win, for the most part the early- and midgame strategies of these different conditions are all the same. This makes it an easy deck to play up until the endgame, where you at last commit to the strategy options that you’ve drawn into. Central to almost all these strategies is to play artifact creatures- and lots of them. 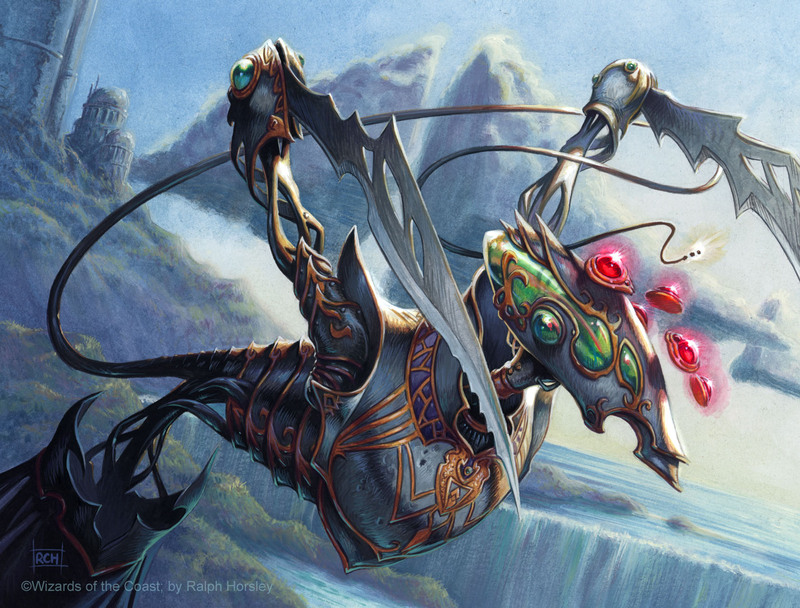 While there’s no turn-1 play to be found anywhere in the deck, Metallic Dreams does ask for a bit of patience in setting up its win conditions, as its early creatures are almost all utility. You have a cycle of Myrs (Copper, Gold, Iron, Leaden, Silver) and a lone Vedalken Engineer for early mana ramp- as 1/1 bodies, they don’t offer much threat. The last two-drop, an Arcbound Slith, is your biggest offensive threat here, and even that is somewhat conditional. Moving to the 3-drops, you still have a mix of offense and utility. Shards of Alara’s Master of Etherium is the clear champ here, acting as a Lord to your other artifact creatures and typically growing in size as the game goes on. An additional pair of Myr (Sarcomite and Suntouched) offer some threat, while a Wizard Replica gives the deck its only countermagic card (as well as an able blocker). The real beaters begin to appear in the 4-drop slots, though in keeping with the theme of a mechanical deck they can be quite conditional. The Sunburst mechanic must be used to its fullest to get the most from the pair of Etched Oracles– the opportunity to draw into three cards should not be taken lightly. Note also that there are enough ways in the deck to add +1/+1 counters to any of the creatures that it’s perfectly feasible to activate the Oracle’s ability and have it still live. The Arcbound Crusher starts small (a 1/1), but can quickly grow if properly nurtured and protected. Similarly the Lodestone Myr is of small stature (a 2/2), but can also punch above its weight under the right conditions. Rounding out the position are a further pair of Alara-block cards: the Arsenal Thresher and Sludge Strider, both of which are assets in an artifact-heavy deck (and they don’t get much more artifact-heavy than this one). These bodies have the potential to usher in our first (and most basic) win condition. Lastly, in the 5+ position we are introduced to our heavy-hitters, which not only reinforce the previous win condition (Broodstar, Pentavus, Qumulox) but offer one of their own. Whether this be straight to your opponent’s face for the kill, or just clearing out some choice defenders to get there in the red zone depends on the game state, but either have the potential to close the game for you. This slot also contains a pair of Myr Enforcers, which take advantage of the Affinity mechanic to potentially deploy quite cheaply (even free). And while Metallic Dreams is almost by necessity a creature-heavy deck, there is a healthy stable of support (including some Blue magic) in its noncreature array, including our last two win conditions. Just as Green is the colour most inimical towards artifice, Blue has long tended to be its greatest ally of the colours and unsurprisingly shows up to play a small role in support here. Fabricate allows you to tutor for any artifact you need and is tremendously versatile. Thirst for Knowledge and Keep Watch both offer card drawing (though like any conditional spell Keep Watch can range between staggeringly good and dismal), and a Whiplash Trap rounds out the quartet. Tinkerers will note that given the strength of Fabricate, the deck could well be improved by the inclusion of more (especially considering that three of our four Win Conditions here are driven by a specific card). The deck also boasts some additional colour fixing (two Pentad Prisms), creature enhancement (Loxodon Warhammer, and the infamous Cranial Plating), utility (two Skeleton Shards and a Serum Tank), and creature token generation (Nuisance Engine). 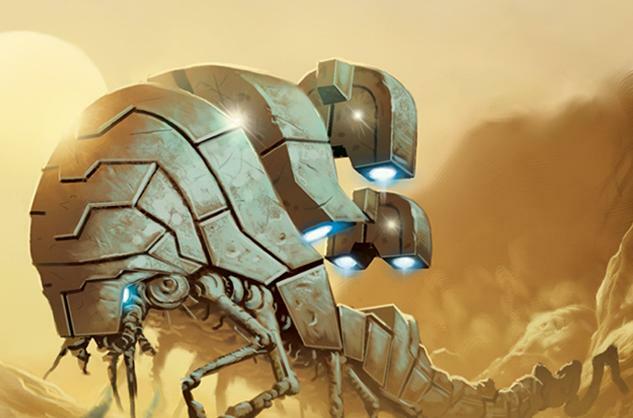 While the Pest tokens generated by the Engine are nearly useless on their own, their most important characteristic is that they each count as an Artifact themselves, and thus have synergy with the Affinity mechanics as well as many other cards (Cranial Plating, Serum Tank, Broodstar, Master of Etherium, and Sludge Strider, to name a few). Plenty of early plays, and the slightly heavy tail is more than supported by the high number of non-land mana sources the deck deploys. Taken together, Metallic Dreams has amazing synergy. Almost every card either directly or indirectly supports another card. Although this is in large part to the presence of Affinity (where any Artifact card could be said to be ‘in support’), there are still a number of other supported subthemes such as cards that care about the number of artifacts in play, and +1/+1 counter movement. Join us in two days when we take it for a drive and find out. ← A Glimpse of the Scars of Mirrodin Intro Packs Revealed! Skeleton Shard is really good in this deck.